Spaceranger Joel Loved This Buzz Lightyear Cake! To make Buzz, I used a butter cream transfer. I took a coloring page off the internet and enlarged it to fit my cake size. I then attached it to a hard surface and covered tightly in plastic wrap. I began to outline the picture in black icing and then essentially coloring the picture with icing. When I finished I put it in the freezer. Next I applied a thin layer of the background icing color to the picture and returned it to the freezer. Once I had my cakes made and iced I took the picture and flipped it onto the cake and removed the plastic wrap and VOILA. It was easy to do, but time consuming. I made a trial run first and was amazed. I look forward to making Woody for my other son's party in the winter. This is my favorite buzz cake I have seen to date. I am going to be making a buzz cake myself and have a few questions- like how thick did you put the icing when you colored it in and when you "flipped" it over on the cake, was it not transposed? Did you already have a layer of icing on your cake? Anything else I should know? Thanks a bunch- beautiful work! I absolutely love this cake! You did an amazing job. My question is about the transfer. How do you get the transfer onto the cake? It seems as if the picture would be face-down on the cake. TOO CUTE! VERY NICE JOB! Nice job on this cake. I love the bright colors. Thanks also for the excellent description of how you made it. Awesome! Join in and write your own page! It's easy to do. How? 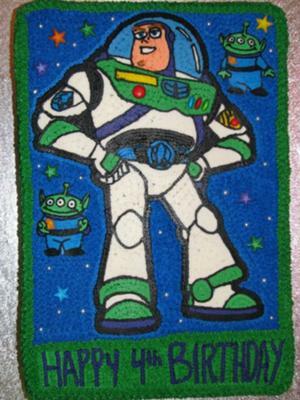 Simply click here to return to Buzz Lightyear Cartoon Birthday Cake.